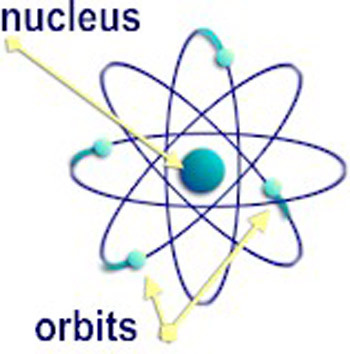 This model doesn’t work – orbiting electrons would lose energy and eventually (in about 10-10s) fall into the nucleus. Niels Bohr came up with the solution to this problem by considering the absorption and emission spectra of hydrogen. 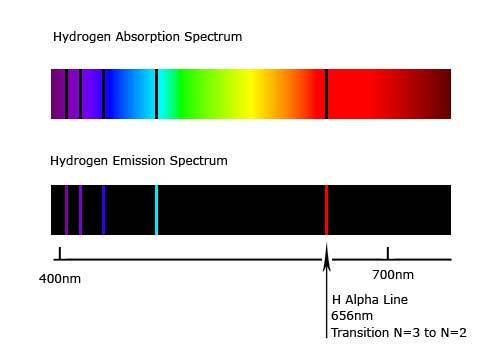 When you shine light through hydrogen gas, you don’t see a continuous spectrum, but a line spectrum (as shown below). Bohr was able to explain that by postulating two things. 1) An electron can only exist in certain energy levels within the atom and 2) the electron can undergo a transition from one energy level to another. It is these transitions that we see on the line spectrum. where Z is the atomic number and n is the energy level. This equation can then be used to find the energy of the transitions. The transitions are grouped together in “series”. Each series corresponds to all the transitions to/from a certain energy level. The Bohr model accurately describes the energy levels of single electron atoms, but fails for anything larger. For that, we need to look at exactly how the electrons behave when they are near the nucleus.